I am a big fan of Quinoa and its possible after 3 years I am finally able to pronounce it correctly. Maybe. I was purchasing white, black, and red quinoa so that I could mix it together for a colorful appearance but now Trader Joes does that for me with their Tricolor Organic Quinoa. I saw this on Pintrest and thought this might make a good way to cut my craving for cilantro rice. Sorry it was so good we ate most of it before I remembered to take a picture. In case you missed it I recently made an amazing Quinoa salad that is based on a pin from Martha Stewart’s page and I have tailored it to my personal preference. Recipe post here. It would be a great way to double batch and use this recipes left overs in a different way. We already know that I am not the greatest at following instructions on recipes. In my married life I have come to learn that you have to be able to recognize that some recipes you really have to follow measurements and instructions to a ‘T’ or you will get a total mess, like a watery apple pie no one will touch (thank you Thanksgiving of 1999). Since cooking is already a chore I try to make life easier on myself and find recipes that I can easily change according to what I like and what I have on hand. Plus my taste buds are not the same as everyone elses. 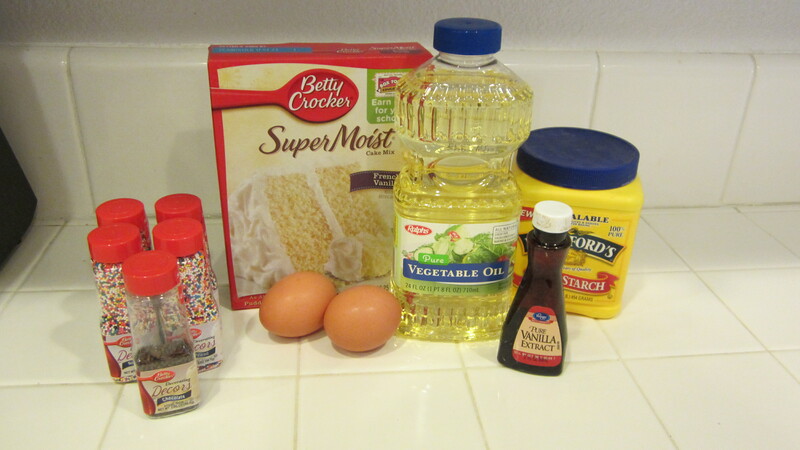 So I often find myself adding or subtracting ingredients after I made them according to instructions the first time. Here is a great bulgur salad from Martha Stewart that I love in its original form. 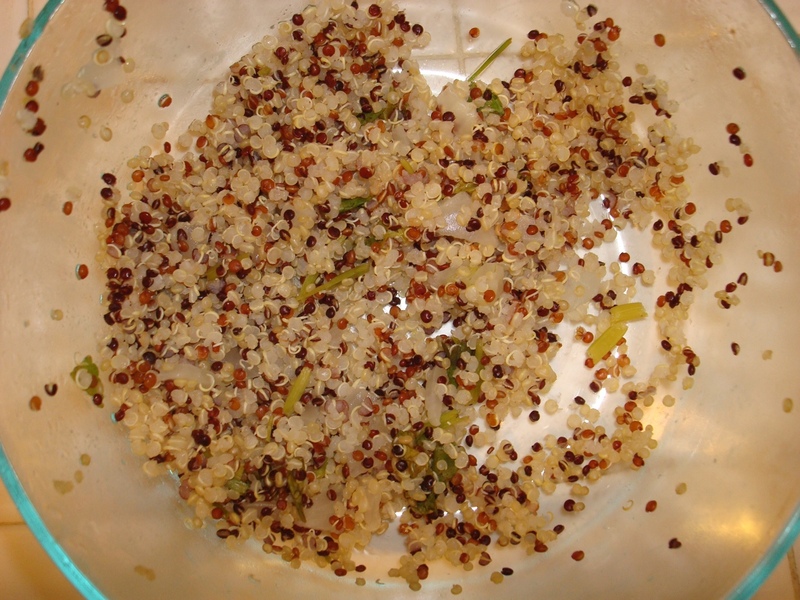 In a large bowl, pour 1 cup boiling water over the bulgur. Cover with plastic wrap; let stand until water is absorbed, about 30 minutes. My husband tries to eat wheat free and so I cook accordingly to accommodate this request. 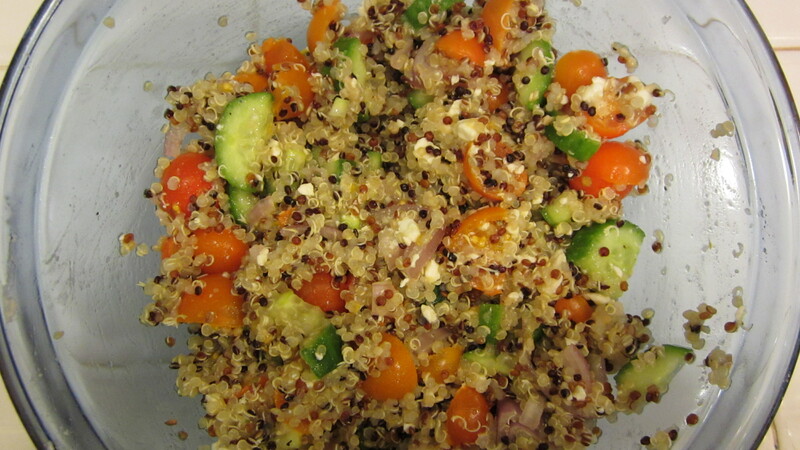 I turned the above recipe into this Quinoa salad and added a few things I like. It is an incredibly healthy salad that is great for summer since you can eat it hot, cold, or room temp. Its also a great way to use up left over quinoa. Cook Quinoa according to package, I use water only for this recipe. Please be advised. I made this last night but was out of cilantro and avocado. They were sadly missed. 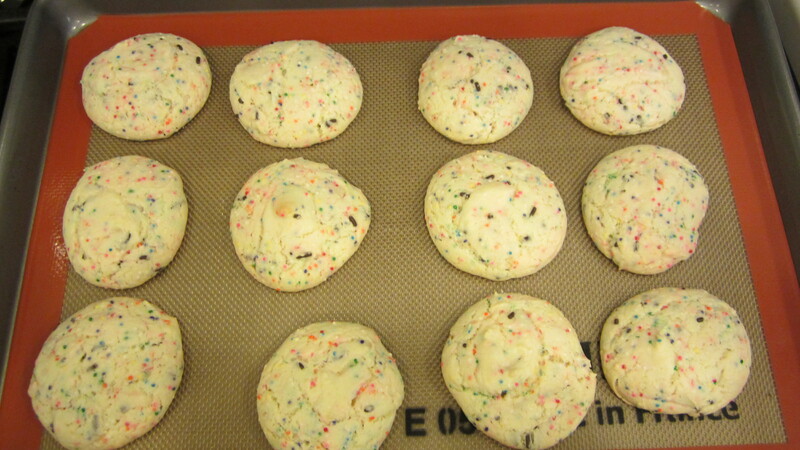 One of my girlfriends couldn’t stop talking about how she wanted to bake something and she was craving the cake batter cookies from Pinterest. I told her since we were already getting together with her and her fiance for dinner lets bake the cookies that night. We went to the store and gathered the few things we didn’t have in our mutual cupboards. At the store she told me that she had also read a second pin that said that cornstarch in place of baking powder made fluffier cookies. I thought well let try it and see what happens. 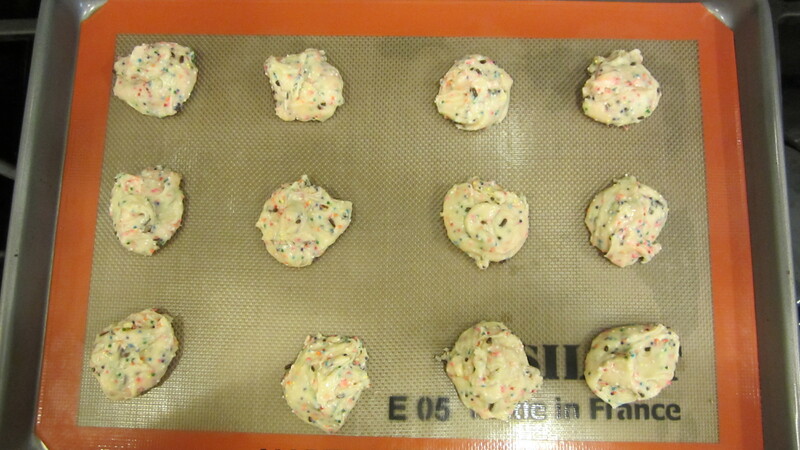 We then found that they didn’t have the type of sprinkles the recipe called for so we got the little nonpareil dots. This would be our second adjustment to the recipe before even making it home. 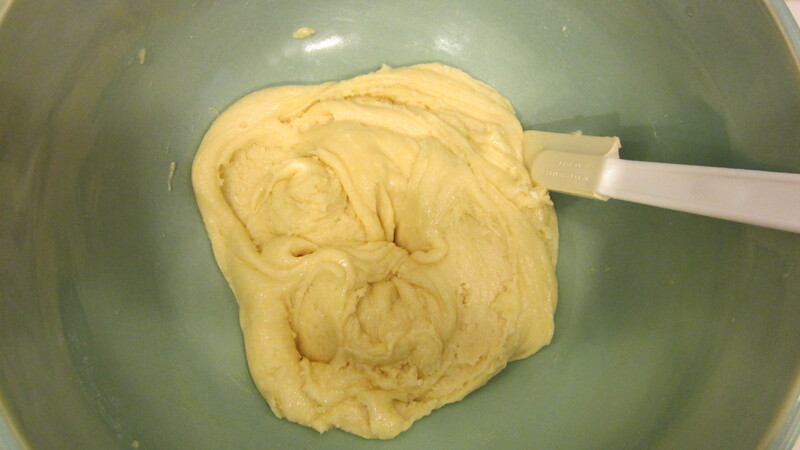 Once home I started to put together the recipe by gathering all our needed items, the left over chocolate sprinkles I had, and a bowl to make it, a spatula, spoon and a whisk. 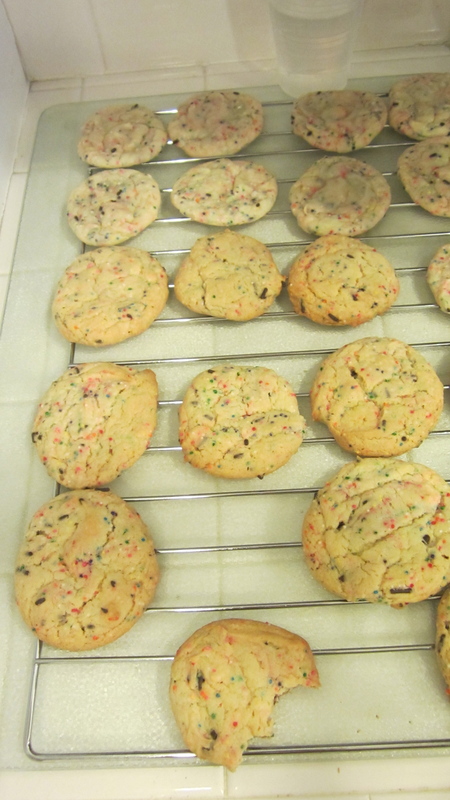 That looked like a lot of sprinkles to us so we decided to not add any more sprinkles even though the recipe called for a full cup, which would have been 3-4 bottles of the nonpareil. 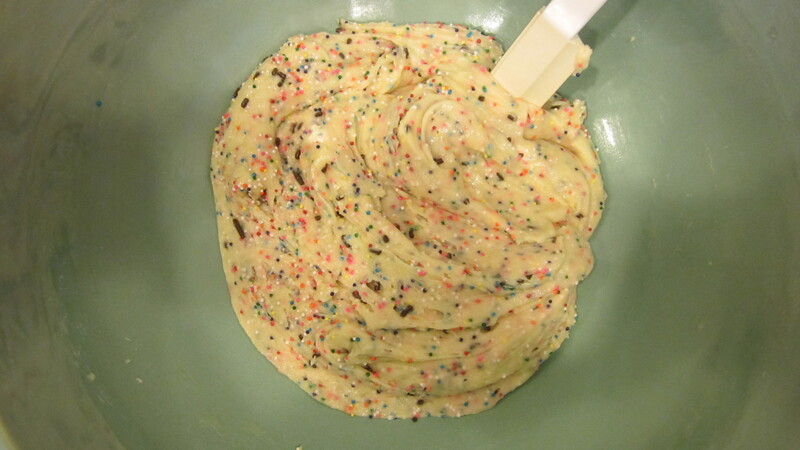 I must warn that we did use different sprinkles so before you start tailoring your recipe keep that in mind. In the interest of your budget these bottles were on sale for $2.99 a bottle so add slowly until you get the sprinkle ratio you want. Onto the pan they went, using a soup spoon from my cutlery set (I think that’s what the large of the 2 spoons that comes in your sets is.) The recipe says it yield 30-32 and we got 28 cookies. 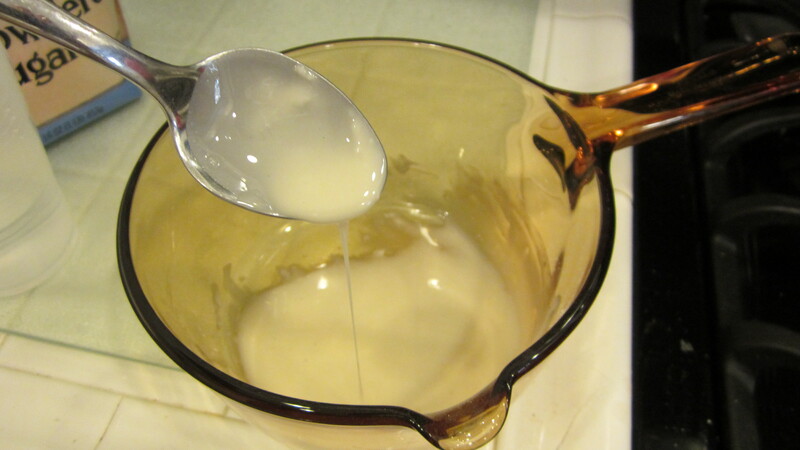 While they cooked I got a brilliant idea to make a sugar glaze for an icing. I Googled simple sugar glaze and picked the first one listed. Got out my pot and saw it needed powdered sugar and water and took everything to the stove. 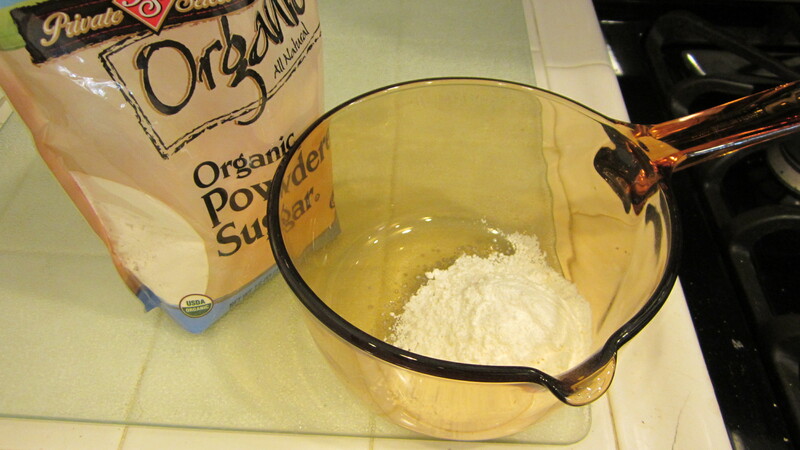 It said to use a cup of powdered sugar and 1-2 tablespoons of water. Looked good to me. Cookies baked for 10 minutes I pulled them out added glaze to half of the first batch. At 18 minutes they were a bit crispier and had a golden color to them. I LOVED THEM! I would probably set them for a 15 minute cook time in the future but these were really easy and so good!! Ahhh Pinterest, the never ending boards of things I love and want to do but will never end up doing. Ok screw that, my new mission is to try to recreate the things I have pinned. Whats the point of having a Pinterest if I never take those ideas and put them to use? According to Pinterest I can become an amazing chef, a crafty interior designer, a creative gift wrap expert, party planner on a budget, all while wielding a saw and making my own bed frame. 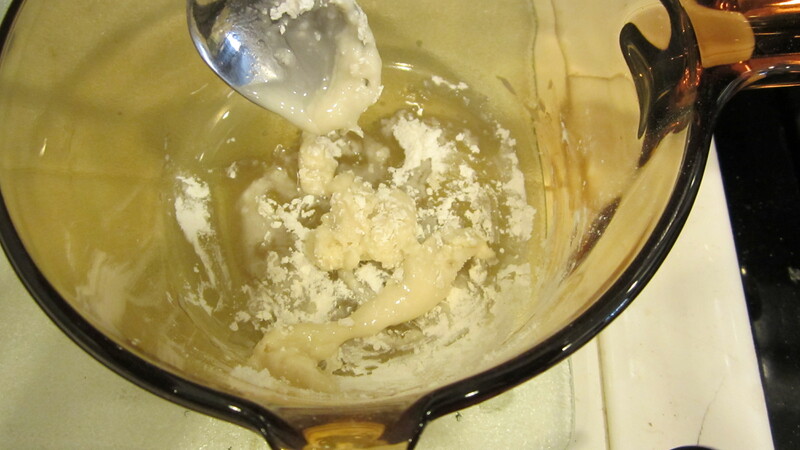 Did I mention that I once screwed up instant mash potatoes? INSTANT. Like from a box. No joke. (I partially blame my family for that, who serves instant on a holiday?????) I have come a long way since then but just to warn you what we are working with here.